Happy Workout Wednesday! Today’s post is going to be pretty quick, because I’m short on sleep and running (literally) out the door! Thanks to all your comments on my anniversary giveaway post, I heard the call loud and clear for some easy-to-access, free (or cheap), limited-equipment-required workouts that can be done at home or in a hotel room. Even if I run in the morning, I often try to squeeze in a quick burst of interval training, strength training, or yoga in my hotel room after the run, or after leaving the client site (before I start working again). Not only does interval training burn a TON of calories, but the variety that incorporating cross-training activities like these provides is super helpful in preventing injury, maintaining strength, and toning your body. The good news for those who asked is that I have dozens of convenient online workouts to share! But I’m going to stick to 7 for this week, and will follow up on future Workout Wednesdays with several more. For now, bookmark this page, and experiment with a few to find what you like. Enjoy! Self.com’s 10 Total-Body Workouts in 10 Minutes or Less (free, 10 minutes): When you really only have a bit of time, these pack a good punch and leave you feeling energized. Plus, I love the variety! My Pinterest board on workouts (free, most are 10-30 minutes): I read a lot of blogs, and many of the bloggers I love create their own interval workouts (I plan to eventually start doing this, too!). When I see one I like, I try to remember to pin it (and I’m getting better!). 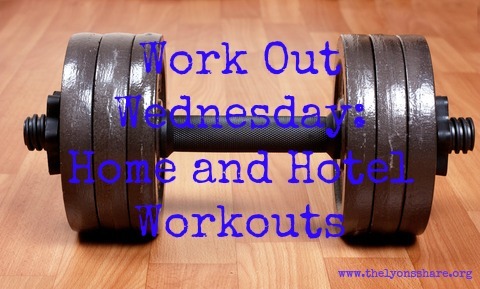 I’m generally looking for workouts that can be done in a hotel room, and require minimum equipment. I like a mix of cardio and strength, with some high intensity thrown in for good measure. If you see some workouts you like on my boards, you can also see who else pinned it to find other similar workouts that you might enjoy. Barre3 videos ($15/ month; 10, 30, 40, or 60 minutes): I honestly feel more toned after less than a dozen of these workouts. The small, focused moves and light weights may fool you into thinking you’re not getting a great workout, but you’ll feel the burn the next day! Daily Hiit videos (free, 4-24 minutes): I’ll admit that the … um … amount of skin you see on the videos is sometimes a bit much for my personal taste, but the workouts are killer – I never thought I could sweat so much in 12 minutes. While they use equipment, it’s usually easy enough to find ways to modify if you don’t have it (e.g. use big water bottles/ small suitcase or desk as weights, use two hotel chairs instead of the Equalizer). YogaDownload.com podcasts (free to $9, 20-90 minutes): I’ll always prefer in-person yoga classes, but I’ve found these to be a great substitute if it’s impossible to get to a class. Many of the 20-minute classes are free (with an audio portion and a pdf pose guide), and you can download them to your computer for unlimited use. I love the Yoga for Runners classes, the Hip Opening Flow classes, and some of the Detox Flow classes. The rating system is pretty good, so pay attention if you choose to buy. While I use Yoga Download, this site also lists other websites with free yoga classes. Shape.com’s Circuit Workout (free, 25 minutes): If you have access to weights, this is a great workout, and you can customize to fit your own needs and time availability. Many of the other Shape.com workouts are great, too, so look around! Fitsugar workout videos (free, 5-25 minutes): Fitsugar offers a lot of workout videos, usually around 10 minutes. I’ve linked to one here that I’ve done before, but I’d recommend surfing the site to see what might best meet your needs! Tell me in the comments … which of these workouts will you try this week? Do you have other suggestions for online, easy-access, limited-equipment workouts? Are you looking for advice on how to choose or start a workout program? Couldn’t agree more – even 10 minutes here or there helps! Sorry I missed you in Dallas!